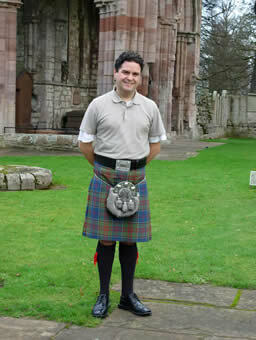 I set up Mini Tours Scotland in 2004, with a lifetime of experience of exploring Scotland, the UK and Ireland. My aim is to deliver a very high quality tour experience for visitors to Scotland, but in a different way from set bus tours or expensive chauffeur drives. Tour buses simply can't go on many of the small Highland roads or narrow cobbled streets. Tour buses have strictly set routes and times - so you only get to see what they've prescribed. I've always been passionate about Scotland and wish to share that passion and enthusiasm with you to show you the real Scotland in a flexible, relaxed, informative and fun way. Many of my clients come back year after year and have became close friends. I was born and bred and live with my wife and our 2 young boys in the town of Greenock, on Scotland's west coast, where generations of my family have lived and worked for hundreds of years. I studied at the University of Paisley, graduating with a BA(Hons) business degree. Whilst at university I won the highly prestigious Shell Technology Enterprise Program (STEP) for being the most Enterprising Student in Scotland and the UK award for best Marketing student, chosen from thousands of UK university students. I then worked in a variety of executive Marketing roles with both small and multinational companies for nearly 10 years, whilst also working as a volunteer with Scottish conservation charities before deciding on the career change that led to the creation of Mini Tours Scotland, with a home office in Greenock and a base in Scotland's historic capital, Edinburgh. I have always loved the great Scottish outdoors since being able to walk! I was involved in the Scout movement since the age of five for almost 15 years in a kilt! (the Scout uniform in Scotland). This gave me my early experiences of Scotlands outdoors, with a big emphasis on camping and hiking all over Scotland. Over the years I have also traveled extensively all over the world, visiting all of Europe, Southern Africa and New Zealand. I have been to North America countless times after spending 6 months working and traveling there. I even got married in New York City and returned recently for the anniversary - a wonderful 3 week tour of the west coast, one of the highlights being Yosemite National Park in California. But my home, heart and passion will always be in Scotland! I've also been fortunate enough to be a conservation volunteer with organisations such as the National Trust for Scotland. At least once each year since 1992 I've taken part in a week long conservation project in the remote and wild parts of Scotland. Recently I was on the remote Isle of Canna (pop 13) helping the local crofters in various tasks. Previous years have been spent on Isle of South Uist, Isle of Colonsay, Ardross Castle, Kingussie, East Lothian, Kinghorn, New Lanark, Campsie Fells, Castle Fraser and the Tibetan Buddhist Temple retreat at Eskdalemuir! I have also taken part in major conservation projects in Northern Ireland, Southern Ireland and England. For 1 week each year I take part in a new project - my way of giving a little back to Scotland. These experiences over the years has gave me a unique insight into all parts of Scotland's geography, history and culture - one I'm more than happy to share with you. I'm also a very keen hill walker and can take you on short or longs treks to really see Scotland at its best. I look forward to sharing with you the very best of Scotland! Check out my top ten lists for various sites and venues in Scotland. Updated regularly.